Noticed some work being done today, pretty far along and not sure I've seen it mentioned here. Space has kitchen equipment set up and some high tables with chairs. It did not seem like a big space. Maybe a lunch spot of some sort? This is next to Niahmah and across from BK Scoop. Niahmah's address is 787 Prospect, and it shares a one story structure that seems to be known as 785 Prospect, 789 Prospect, and 791 Prospect. Which, just to make things a little complicated, is also known as 710 Nostrand. and once again the tsarina has the story... Exquisite is moving in there and the corner space will be available. That makes me wonder if Exquisite owns the buildings. ....the corner space would be very attractive to something more upscale than Exquisite, likely willing/able to pay more in rent. The guys in Exquisite told me that they were moving into the smaller spot for the takeout business and the larger corner area was going to be kept for full-service sit down. This was a couple of weeks ago, so I don't know if plans have changed since then. By moving the take out to a diffierent location, they could certainly change their present business model for the corner space. It presently has formica tables and casual dining service. I wonder if they will take the leap to tablecloths and a full liquor lic. I think the neighborhood would support it. walked past today and exquisite is moving around the corner, so the entire space facing nostrand is now available. wonder what it'll be! An entity known as L’Angle Inc., is in the process of asking CB8 for support for a full liquor license for 710 Nostrand Avenue (corner of Prospect). 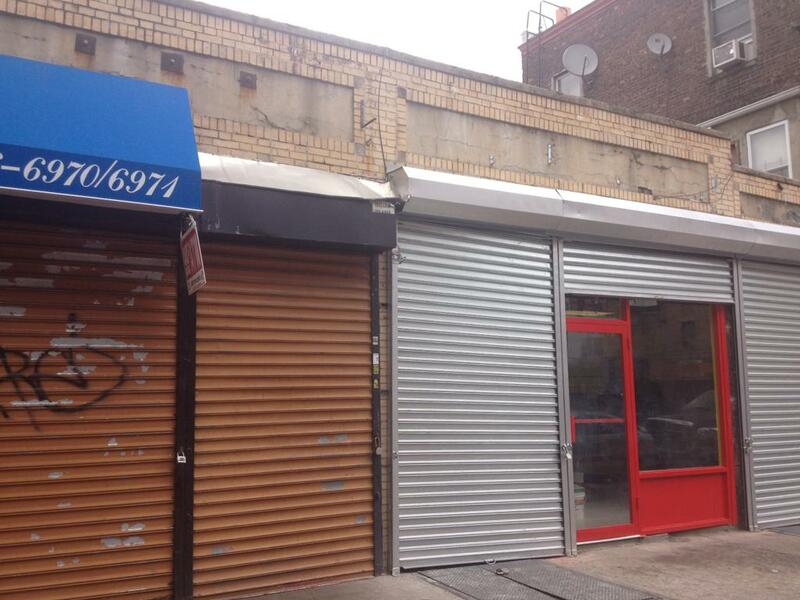 Nostrand is likely to get another bar! oh no. we already have such a problem with alcohol/drug use at our corner. can't imagine it would get better with another bar. Do you feel Nostrand Pub contributed to the scene around its location? If it comes to fruition, this venue will serve a similar clientele. The folks planning it will ask for CB8's support on Monday, October 7, 2013 at 6:30 PM at CNR-Center Light Health Care Center, which is located at 727 Classon Avenue, Brooklyn, NY (between Park and Prospect Places). The entity is now going by Z’ Bar Café. It will potentially have a garden/sidewalk café. They are scheduled to present in front of the CB8 SLA Committee on Nov 4th. Note: they are apparently renters, and distinct from the people who run Exquisite. The drug and alcohol problem will not be exacerbated by another bar/cafe. The alcohol/drug use people dont have money to go to a proper establishment. If anything better stores and restaurants will not tolerate bums hanging outside their establishments. and I would think twice about a garden/sidewalk cafe, there always is a sewage smell in that intersection. This is a high profile corner, and I am interested in seeing who has the experience and capital to take it on. At first glance, it appears as if we may have already had one prospective bar tenant back out, for another. At the SLA mtg, we will learn just how experienced the applicant is. If I was to open up this place, I might start it out with a West Indian theme. The area might not be quite ready for something as generic as St. Catherine on Washington Ave. The good news (!) about the drug/alcohol activity at that intersection is that its mostly older folks who start their day off about mid-day, have cajoled, begged, or financed their way into their vice of choice by the late afternoon and are usually inside and settled by the late evening. While they do sometimes get rowdy, they seem to spend most of their energy yelling and arguing with one another over whose turn it is to go into the liquor store. They don't strike me as the type to even think about wandering into a bar for a drink, and if they do, I suspect their choice would be Q's Tavern which seems to cater to the old man drinkers in the neighborhood. Like Tsarina said, they are more of the $5 Thunderbird and the $2.50 nip crowd and less of the cocktails and microbrew set. I don't think they'll even focus on whatever comes to that corner. In the rare event that these folks have money and want to spend it at a bar, they are usually not welcome at bars that must stay full to stay in business. These folks tend to cause others to avoid their haunts, and are thus bad for business. Z Bar Cafe would be foolish to make them welcome. The owners appeared at tonight's CB SLA mtg. They didn't quite have all of their paperwork in order, and were asked to come back at a later date to try again. However, my gut tells me that they will indeed get their paperwork in order and be approved. They are new to the whole food service, bar industry scene. They seek to open a venue that has about 40 seats and closes at 3 AM. Hmm, between the name of the place and that CB SLA presentation, it doesn't sound promising. Maybe I can't disassociate it with Q's Tavern and Island CZ Cafe. What's up with some proprietors feeling the need to let everyone know what the their establishment is? - i.e. Tavern, Bar, Cafe. Maybe I just prefer an mysterious or misleading name (ie - Franklin Park is not a Park and the Crown Inn is not an Inn) and ambiguity. I do hope they have not under estimated the length of time it takes to navigate the DOH and SLA processes. I believe they are renovating the storefront currently, and the time between when you done renovating and when you can open is brutal on the check book. ....the BBQ place on Nostrand at Union is presently in this brutal stage. Z Bar Cafe will next appear on Monday, December 2, 2013 at 6:00 PM at CNR-Center Light Health Care Center, which is located at 727 Classon Avenue, Brooklyn, NY (between Park and Prospect Places). The owners appeared at the community board committee meeting last night in sharp dress clothes with printed copies of their application and a pen for every board member -- they certainly seem to be trying! The committee voted to support their application for a license - but they'll have to jump through several more hoops to secure rights for the garden/sidewalk cafe. The owners said they hoped to open in February. Also, the owners struck me as very genuine and committed - they're a hip and good looking young black man and woman who've never applied for these kinds of licenses before -- just the kind of Mom and Pop shop the CT muffin thread seemed to fear would be crushed out of existence. I wish them the best! Hello hello hello hello! 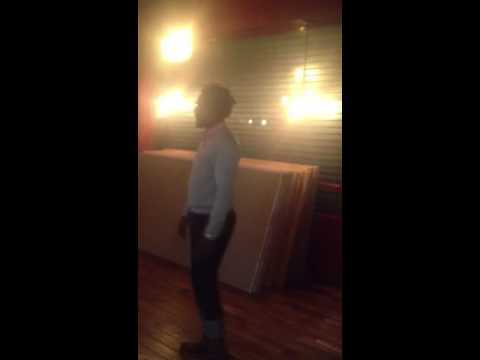 A walk through of z'bar café under construction: say they're looking for soccer fans. I'll be there for the accent. Hello hello hello hello! A walk through of z'bar café under construction: say they're looking for soccer fans, but I'll be there just for that accent. Nice work LP! This man's words were sweet music to my ears! Now I hopefully won't have to travel to Woodwork for a footy session every weekend! Ah, and the name Z'bar Café makes a lot more sense now that we know the owner's from Zanzibar. Can I get a reader who walks by this place everyday to tell me how construction is looking? Maybe ask a construction worker how much longer they think they will need? I pass by at least 2 times a week at random times and haven't noticed evidence of work. I reached out to the owner an have been informed they hope to open in May. So, if all goes as per his plan, we are looking at only 8 - 10 more weeks! This could be the location of our next happy hour. I can't wait until Z bar opens. It will be grat to have an open, hopefully watchful establishment on this corner in the evenings. Is anyone seeing any progress on this place? I haven't, and can't find anything on SLA. So, I am beginning to think this place is not going to open. Aw that would be such a bummer. I am in love with the man in the video above -- he seems so invested in and excited about his space. No activity at this place for the longest time and I seem to recall a sign and that is gone. I will guess that its not happening. Also Some new place on Bergen in Sue Rocks old store. "culture station" or something. Fancy sign, never see it open. Dont pass by there much. The gates were up for a while this afternoon, with new "for rent" signs. Looked in the windows - appears that they got maybe halfway through with renovations (fancy light fixtures installed, old bathrooms only partway ripped down). Too bad. In other news on this corner, BK Scoops / KaffeJac is now a barber shop. The real winner here is the guy who makes the awnings, as they get a new one here every six months or so. BTW, I believe the owners of Exquisite own the entire building. They moved the restaurant to the back portion when they realized that they could rent out the front for good money. I believe they are attempting to find a new tenant on their own, as opposed to through a RE agent as a result of not finding any ads for the space online. A new tenant may have been found. An entity Arman Sayed Corp has recently been incorporated using this address and has requested a kitchen inspection. Huh. The only thing my creepy googling was able to turn up is that the person who registered the corporation is named Abu Saeeyd, he has no other businesses to his name, and he lives on Underhill and Dean. Do bodega delis need kitchen inspection? So, I believe Abu Saeeyd is going to operate a restaurant. we don't need another bar but restaurants with atmosphere and exciting food, yes. the SLA & Sidewalk Café Review Committee will meet on Monday, December 1, 2014 at 6:00 PM at CNR-Center Light Health Care Center, which is located at 727 Classon Avenue, Brooklyn, NY (between Park and Prospect Places). Holy jesus! I've been dreaming about a bistro for years...a brasserie is a step up from that! On Nostrand! be still my heart! @whynot_31 do you have a link to the actual alcohol permit application? Also, because I want to know everything about this, right now, wondering whether the extra "i" in brassierie is your typo or theirs. Imagine! A brassiere sales and fitting shop which also serves booze! @lilern - I cut and pasted from the CB8 mailing I received. It could be that one of their staff made the error. This place does sound wonderful. Whynot, how does one get on this CB8 mailing list? One emails brooklyncb8@gmail.com, stating one's desire to get SLA mtg announcements. However, the list has yet to include photos of the variety @Booklaw might enjoy. I hope to drop by tonight to see if the new proprietor shows up, and introduce myself. ....serving drinks to people while they watch women try on bras could work. Sounds like something people might like. Hence, he is simply taking over an existing restaurant. Returning to the corner space: This will be a 2nd alcohol license by the owner Breukelen (the coffeeshop and cafe on Franklin near St. John's). At this additional location, he seeks to be open 7AM to 1 AM, 7 days a week. He'd like to open as early as Feb 2015. It would have a cafe/bistro menu, and serve breakfast, lunch, and dinner. The committee voted to support the application. Nostrand, it sounds like you are getting upscale casual dining. I think this place will stop short of full table service, but it sounds pretty close. Hooray! I had heard that the man behind Breukelen was going to open up a spot on Nostrand. What a great space, what a great corner. So much potential. Hooray for our brasserie! I don't have much to add, i'm just really excited about this. Three cheers for sit-down dining! And actually, @whynot_31, given that this place will also be run by a restauranteur who already owns a business on Franklin you're right that my espresso-snob mystery man from the beauty world thread may have been working for them rather than Two Saints. From a solid source, I hear that Brooklyn Brasserie will open in 6 weeks. At the meeting I attended, the owner stated he planned to open before he rec'd his liquor license, because unlike some of the venues we are watching, this place will have a substansial food menu. He just filed for his alc lic on 1/5/2015, and I would be surprised if he gets it before April 1. "The new eatery’s owners hope to open by April 1, said co-owner Frank Warren and chef Jonathan Boe, with a menu that will include “French-inspired” dishes like filet mignon and duck confit served as small plates, all priced under $10." That would give him roughly 6 weeks from today to finish construction and get DOH's sign off on the kitchen inspection. While the photos show them as being pretty far along, that is an aggressive timeline. Hopefully DOH's schedule is not backed up, and they pass on the first try. A request for an inital kitchen inspection has recently been filed, using the 789 Prospect address. I think a restaurant with plates priced at under $10 is exactly what we need. I am hearing that he may make his April 1 goal. Q: Why hasn't this place opened yet? A trusted source informs me that the hold up is reportedly getting the permits in order. I.E. BREUKELEN BRASSERIE feels it has a kitchen that is ready, but it either can't get DOH to look at it, or DOH looked at it but does not agree. Hopefully this will get sorted out by May 15th. they should have steam cleaned the brickwork for this great awning. ouch! From a tenant's perspective, "steam cleaning the exterior of the building is the landlord's responsibility". From a landlord's perspective, "we got a tenant at the rent we wanted without having to pay for steam cleaning. Why would we do it?" Rumor has it that, in light of the failure of nearby Two Saints to obtain a dining crowd, Breukelen Brasserie has changed their mind and is waiting until they are able to serve alcohol. I had no idea Two Saints had any type of food. Sad to hear BK Brasserie is waiting to open. I've been looking forward to it! It is not clear to me how much effort Two Saints has put into the dining aspect of their business. At the start, it seemed as if they wanted to be both a coffeeshop and a bar. Equal ratio of each. Now, they seem to be putting very little effort toward the coffee shop crowd, while nearby Lula Bagel seems to continue to do well. Food and coffee are a central parts of Lula's identity. The new place (Breukelen) stated that they would have a larger focus on food than alcohol. 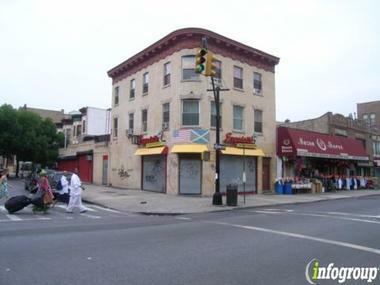 I believe that Nostrand has a number of laptop and tablet people looking for a place to spend time and money. So far, they have not chosen Two Saints. It does not have the tables, outlets, and visibility many coffee shop customers seek. I am interested in seeing how B Bra proceeds. I think a coffee place with big tables, food, wifi and alcohol could thrive on Nostrand. I believe there is customer base that is ready. The nearby place on Rogers (Manhattanville) seems to be doing quite well. I think Breukelen Brasserie will thrive. And since they have a strong small plates dining focus, waiting until they can get the booze and wine flowing along with the food is a good decision, I think. Their location on Franklin seems to be equal parts food and coffee, with some beer and and wine. They have created a dine in, spend lots of time here, experience. ...that experience could give him a leg up on Two Saints. The little bagel place and coffee shop that Mike D runs are mainly take out places. My sense is that the local customer bases wants some place big and comfortable where they can enjoy time outside of their cramped apartments, and potentially be seen and approached by someone good looking. I think B Bra gets that, whereas Two Saints has created a setting that is too formal, and perhaps too intimidating for such "first contacts" during the day. For example, one can not see into Two Saints from the street. During the day, how is anyone supposed to know whether anyone is good looking in there before they go in? Once inside, the layout it is not really condusive to meeting NEW people during the day. ...whereas coffee shops have big tables that facilitate -um- offering and getting assistance using a website from good looking people. I definitely noticed that about the windows. I thought it was an odd choice. My beef with the windows at Two Saints is that they are never clean. Always streaky! I compare with the exquisite beauty of Colina Cuervo, and their daily window cleaning, and I pick Colina every time for my coffee. Maybe I am weird. An inherent part of being weird is being unique. Although I am not aware of their reasons, I see others doing the same thing. Hence, you are not weird. True. Black covers on the windows is a bad choice. It's a pity it opens at 4pm now. I loved sitting there in the morning for breakfast (they did have very good croissants) waiting for my laundry. My laudromat is next door. Brooklyn Brasserie is now open. I went last night for dinner, it was really delicious. Small plate menu all priced under $10. I recommend the escargot, they were fantastic. The owners were really friendly. Great addition to the neighborhood. More details!!!! I'm trapped in Schnectady and unable to come this weekend. Who would have thought that Nostrand Ave would offer escargot before any place on Franklin? The wine list is all french natural wines which I think means they don't have any additives or added yeast. We tried 2-3 different reds and they were all good. Wines are priced at about 9/glass, but they also have 1/2 liter and liter options for white, rose, and red wine. those are priced at $15 and $30 respectively. They had 3-4 french beers on tap. I heard the owners talking about some happy hour special, but I didn't really catch what the deal was. The menu is small and has two sections, salads and tartines. The tartines are like a piece of chewy bread and then it is topped with things like either escargot, or mackerel, avocado and egg, etc...they were good. For salads they had nicoise, salmon, etc. It also looks like they have a very serious espresso set up and a little case for pastries. We were there at night and they didn't have any pastries, but I assume during the day this will be stocked up. The space is nice and open. Opposed to two saints, their windows are big, clean and bright. A huge bonus. The guy at the bar said coffee and pastries in the am are coming. Just a note, they currently have no credit card system (or at least it wasn't working when I was there) so it is cash only. The waiter failed to tell us that until after we had ordered drinks, so make sure you ask. Just went tonight. Great place. It did not go very smoothly, but it's only their second day, I forgive them. Note that they carry 4 beers on tap : Stella cider, 1664 blonde (pilsner), 1664 blanche (white), and a wild goose. The 1664 white ("seize blanche", in french) is definitely my favorite. One salade, one tartine, and two beers, for $29. I'll go back fore sure. Wild Goose? Do you mean Goose Island? I didn't get their hours, but they were open pretty late on Saturday. We left about 10:45pm and they showed no signs of shutting down any time soon. @dac545 : yes, Goose Island. As mentioned above, the owners originally planned to be open from 7AM to 1 AM, 7 days a week. Of course, they could reduce those hours if they don't see the demand, and then increase them once they believe the area is ready. What a beautiful space. It is already pretty crowded during happy hours. $4 beers, wines and wells, $1 oysters, and salads/french-style bruschettas to start. Entrees and lunch starts in the next two weeks. AMAZING addition to Nostrand. I can't believe we are getting escargot before Franklin Ave.
Or it could be this Gose? Grand Opening on August 15th! We can ask such questions then. Yes! You're welcome to ask then, check out our facebook (https://www.facebook.com/BreukelenBrasserie/photos_stream), Instagram (https://instagram.com/breukelenbrasserie/) or just stop by! Our owners and staff are super friendly. I'm Gili, by the way, the Brasserie's PR gal. PSYCHED to see this discussion!!! While I might show up and introduce myself on August 15th, I think we should follow up my idea of having a larger gathering here. I suggested the idea back in March 2014, when it was in the process of becoming Z'bar. Would readers be interested in gathering on Thursday, August 20th? ...this would give the staff a little time after their grand opening to get their act together. Heads up drinkers: In addition to B Bra now being open, I have received word that the space next door, Basic Needs 791 Prospect Place, has begun the process of getting an alcohol lic. If you haven't been in a while, B Bra has updated its menu. When they opened, I thought the food was really good, but wondered whether the prices (mid-teens) would fly in the neighborhood. The new menu has an excellent burger, poutine, and assorted other good-for-you and not-so-good-for-you things. I think prices top out at $10 or $11, with most things under that (the burger is $7 if I remember correctly). And the people who work there continue to be super nice. I love the Breukelen Brasserie.